There is surely at least one CD you didn’t have any use for, but didn’t quite manage to throw it out. It’s cluttering your desk along other CDs you burned with music, when memory sticks and flash drives were just beginning to catch on. There’s an upside to all this. You can go green – recycle, and make your very own CD mosaic ornaments for the holidays. 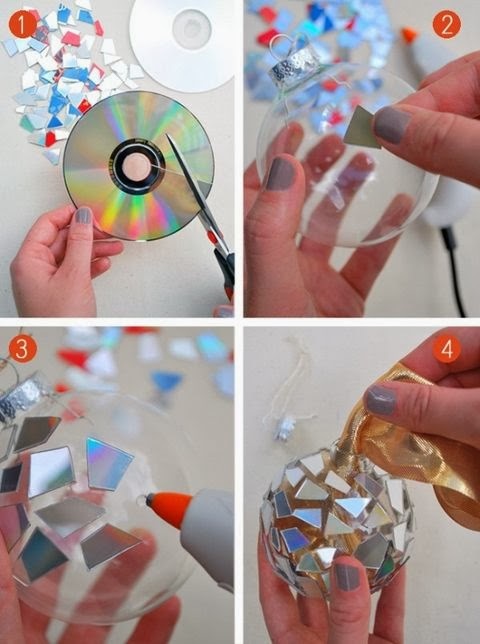 Simply take a CD and use a pair of scissors or a cutter to make little pieces out of it that you can glue afterward on a Christmas ball. It’s a fun process and it makes you a friend of the planet and an inspiration for decorators as well.